Wholesale rates will be different Being a patron focused organization, we are engaged in offering an unmatched array of designer Earrings. Our earrings are widely applauded by our clients for their appealing look, excellent finish and modern styles. This Set Is Simple And And Well Crafted For A Regular Occasion On Indian Dresses. The Chain Is Contemprory That Gives The Set A Rich Look. 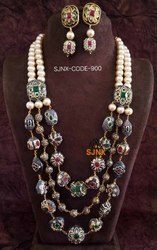 Designer Mala For women jewellery.